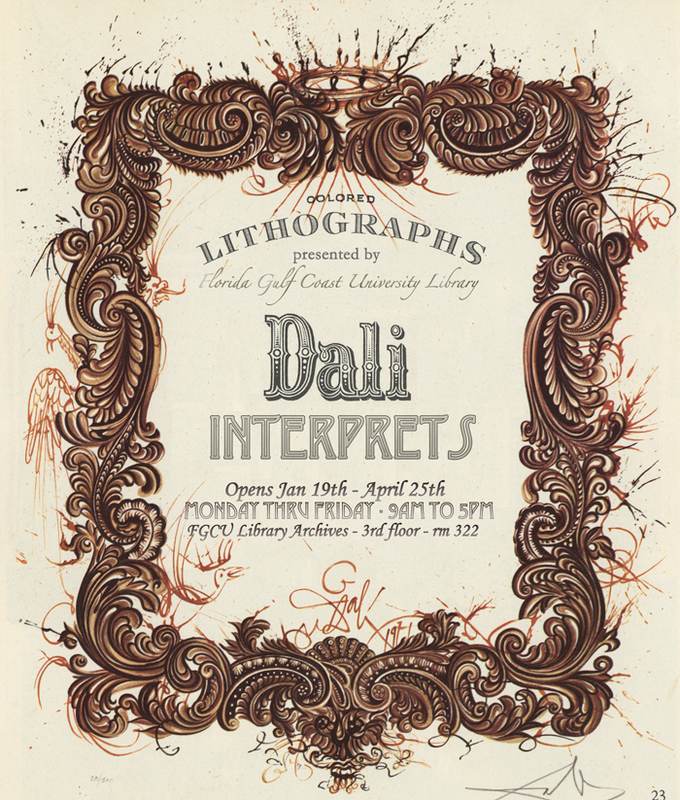 FGCU Library Presents "Dali Interprets"
FGCU Library is opening an exciting new exhibit this week. "Dali Interprets" features works created by the famed surrealist Salvador Dali from two collections: "Currier & Ives as Interpreted by Salvador Dali," which is part of FGCU Library’s permanent collection, and "Changes in Great Masterpieces," on loan from The Dali Museum. "Dali Interprets" opens on Thursday, January 19 with a reception from 5-7 p.m. in FGCU Library Archives, third floor, room 322. Please join us in celebrating this exhibit of one of the 20th century’s most renowned artists. The exhibit will be open to the public through April 25 in FGCU Library Archives. Viewing hours are 9 a.m. to 5 p.m. Monday-Friday. "Currier & Ives as Interpreted by Salvador Dali" was inspired by popular images from the 19th century American firm, Currier & Ives, whose printmaking epitomized American nostalgia. The Currier and Ives realism is in sharp contrast to the vivid, somewhat disturbing, imagery depicted by Dali. Completed in 1971, the six lithographs feature a small facsimile of the Currier & Ives original surrounded by Dali's amplified interpretation. "Changes in Great Masterpieces," completed in 1974, is a suite of prints created as an homage to such legendary artists as Raphael, Vermeer, Rembrandt and Velasquez. Also coupled with facsimiles of the original work, Dali recreates each individual masterpiece with his own playful changes using tempera and remarque. While Dali reinterprets the revered master' work, his changes are subtler than the Currier & Ives suite. Notably, Dali included his own famed "Persistence of Memory" in the suite. For more information, contact Melissa VandeBurgt, Head of Archives, Special Collections, & Digital Initiatives, FGCU Library at (239) 590-7658 or Kaleena Rivera at (239) 590-7506.